If your business is still cleaning the floors with an old-fashioned mop and bucket, you should know that there’s a better way. There are countless benefits to using high-powered equipment such as commercial floor scrubbers. Here are just a few. Keeping the floors clean at the workplace is essential for preventing accidents and keeping up with production needs. Certain industries and markets are more prone to workplace accidents than other, such as grocery store employees. Employees in grocery stores, warehouses, and establishments where meat is handled are at particular risk for slip, trip, and fall injuries, with a 75% greater than average industry rate for all other private industries combined. Workplace accidents lead to lost work days, wages, and, at their worst, insurance claims. And it’s not just employees who are a cause for concern — you’ll be in an even deeper hole if a customer were ever to fall and injure themselves at your business. Having cleaner floors will give you the much-needed peace of mind knowing your workplace is infinitely safer. 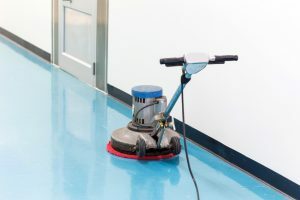 While cleaning the floor with an old-fashioned mop and bucket can take hours to get a good result, commercial floor cleaners can finish the job in half the time or less. But more importantly, some of them don’t require any physical labor to operate at all. Ride-on floor scrubbers are ideal for exerting minimal effort and achieving maximum cleanliness. In addition to being more time-efficient, investing in a commercial floor cleaner can also save you money on water bills. A power scrubber uses water more efficiently than a traditional mop and bucket, and it will give you cleaner floors. Investing in a commercial floor scrubber will immediately start delivering a return on that investment. These machines are designed for heavy-duty industrial cleaning purposes, which means they’re designed to last for years and years with proper maintenance. Ultimately, commercial floor scrubbers are an investment that leads to fewer accidents, more productivity and better overall efficiency. If you’re still not convinced, that’s okay — just give us a call and we’ll make a complimentary visit to your workplace to provide you with a full-length analysis of your business’s cleaning needs and answer any questions you may have. Call us today!